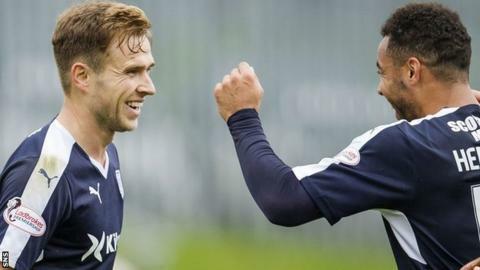 Dundee striker Greg Stewart reckons being on the same wavelength as Kane Hemmings will have a fruitful outcome for the Dark Blues this season. Stewart and Hemmings have scored four goals each since being reunited at Dens Park in the summer. The pair had previously netted 40 times between them for Cowdenbeath during the 2013-14 campaign. "If I can manage to give him the right service I know that he's going to score goals," Stewart told BBC Scotland. "I know the kind of runs he makes; he likes the through-balls. Personally we're best mates off the pitch as well." Hemmings arrived on Tayside following a spell with English side Barnsley. Stewart, 25, hit his fourth goal of the season in a 1-0 win against Partick Thistle which lifted Dundee to fifth in the Premiership. Last season he was a player of the year nominee after scoring 15 times for Paul Hartley's men in his debut campaign in the top flight. "I've started off not too bad so hopefully I can just keep that going," said Stewart. "It's just about improving as a player and as a team player. I played out wide [against Thistle] and tracking full-backs is not my game, but you just have to do it for the team. "This season we've felt that we've been inconsistent but we've actually started most games well." Stewart's 16 goals for Cowdenbeath in 2013-14 came as a part-ime footballer while he juggled a job in Grangemouth. The Stirling-born forward still feels like he has to pinch himself when he reflects on how far he has gone in the game in a short space of time. "Yes just because of the way I've come into football," he explained. "Because I've had a job and that, I've met a lot of people and they always support me every time I see them and tell me I'm doing great. "But you get your doubters as well, that always think I can't do what I did last season again, but I just want to keep improving as a player and keep proving people wrong." While refusing to get too far ahead of himself, Stewart harbours hope of eventually being able to follow team-mate Scott Bain's example and receive a call-up to the Scotland squad. "It's something you always want to do as a footballer," added Stewart. "As a kid you always want to grow up and play for your nationality. It would be a dream but you never know one day if I just keep doing what I'm doing and improving I'll maybe get that call. "Scott Bain had the call and he picked up an injury and was unlucky. He's the same, if he keeps on working hard, and there are a few others there who might get that chance as well."